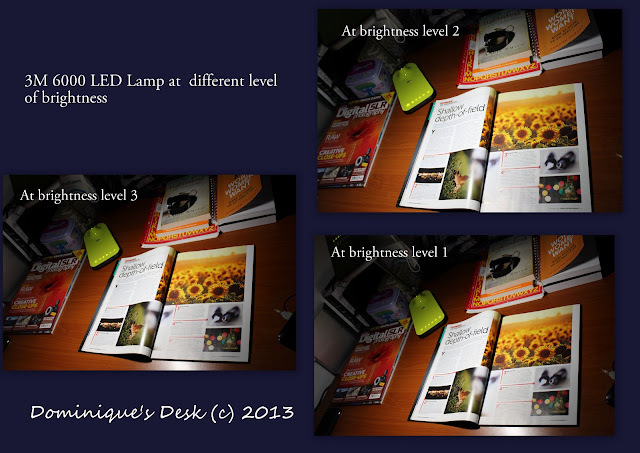 Having a proper study lamp is extremely important if you want to take proper care of your eyes. With the correct lamp you will not have to squint your eyes and face the possibility of spoiling your eyesight due to glare or insufficient lighting. It will also ensure you having the correct indoor lighting to prevent developing blurred vision. We were fortunate to be able to test out the 3M Polarizing Light LED6000 when it was delivered last week. With the Lime Green 3M LED 6000 Polarizing Lamp the kids and I can now do our reading in comfort.We do not need to deal with flicking or glaring light while reading and even harmful ultra violet rays due to the 3M Air Guiding Technology being applied to the lamp. The possibility of having multi-shadowing and electromagnetic disruption to reading is also eliminated. Lasting 50,000 hours with a consumption level of between 3.6-12 Watts the sleek and ergonomic lamp offers five brightness levels to suit all your reading needs. It is certainly nifty energy saving device to have in the home. You just have to take a look at the base of the lamp to see how high tech the design is. One needs to only swipe your hand over the sensors to switch on the lamp and adjust the level of brightness of the light. With a minimum brightness of 10 Lux to a maximum brightness of 1,000 Lux you can be assured of optimal brightness for your reading pleasure. Being a full time mom I only have time to settle down and read my favourite photography magazine when the kids are all asleep. With the 3M LED 6000 Polarizing Lamp I can enjoy reading without disturbing the sleeping baby in the same room. I don’t even need to switch the lamp up to a brightness level of four of five as it is bright enough for reading comfortably under with the ceiling light switched on at the same time. Another feature of the 3M LED 6000 Polarizing Lamp is that it able to be folded up for easy storage. You just have to see how flat it becomes in the picture below. The flexibility of the parts also enables the lamp to be freely adjusted to the direction and height that you require for reading. If you are interested in purchasing a 3M LED 6000 Polarizing Lamp which comes in –Sleek White and Luminescent Green it retails at $269 (w/GST) at Best Denki, Homefix DIY, Popular Bookstores, UrbanWrite, Prologue and all leading retailers. Additionally, 3M will be releasing a new PINK version LED 6000, that will be available in the market from 22nd July 2013 onwards. Disclaimer: . This post has a compensation level of 2. For more information visit our disclosure page. I like how slim it is…. I could always use a light like this. Looks like a nifty lamp! This is perfect timing for this, with school starting. My daughter is loving reading and starting to review, and this would be perfect for her. Especially on late Friday/Saturday nights, when she doesn’t need to go straight to bed. This sounds like a great produce. Thank you for sharing. I like this, and I really like that it lasts so long. It’s a really useful gadget to have. I usually end up reading using ipad so as not to disturb my daughter’s sleep at night. I read that that’s not a good idea though because it affects sleep. Good idea to have something like this lamp. This is great stuff to have. and I love the idea of how small it is very easy for storage and won’t take up much space. Hey, that looks cool and with it being so slim, it could be a great tool for me! I like the slimness of it too, and that you can fold it up flat! I’d love to have this!